Did you ever see something and immediately experience an "Oh, WOW!" moment of sheer joy and creativity? 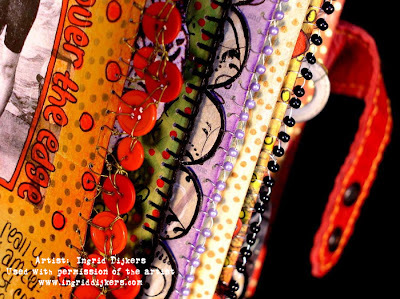 It happened to me recently when I purchased my copy of Somersets "Art Journaling" magazine and saw Ingrid Dikers pages. 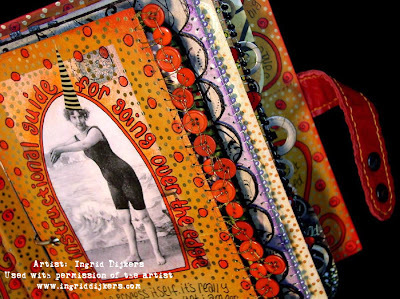 My curiosity aroused, I visited Ingrid's website gallery and discovered her embellished art journal pages. No ordinary pages these! Her gloriously colored pages and ATC's are beautifully and exquisitely adorned with beads and unique embellishments. A veritable feast for the eyes and food for the soul. Ingrid's pages have inspired me to try a few new techniques. I'll be sharing my experiments in a later post. 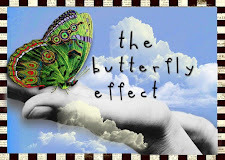 A special thanks, Ingrid, for granting permission to use and share your outstanding work. Thanks for sharing Ingrid's work with us Terri! I can surely see why you did. Her work is amazing. I am in awe of her journal pages and altered books. What an absolute feast for the eyes!! You are SO welcome! When I emailed Ingrid to ask permission to use her images, she was very gracious. Her work is so yummy, it's like sharing cookies with my best friends! Terri, I just read what you wrote on my newest post. I'm so sorry you had a tough day. I wanted you to know I'm thinking about you. I'm going to spend the weekend restoring my soul: reading, watching movies, painting and cooking and drinking some good wine at home. Please find one thing (at least) that restores yours and do it! Write to me, if you have time.